India is home to an extraordinary variety of climatic regions, ranging from topical in the south to temperate and alpine in the Himalayan North. 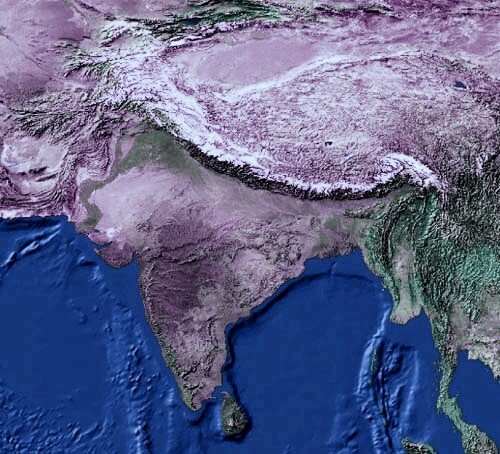 The Himalayas act as a barrier to the cold winds flowing down from central Asia keeping the bulk of the Indian sub-continent warmer than most locations at similar latitudes. As such, land areas in the north of the country have a continental climate with severe summer conditions that alternate with cold winters when temperatures plunge to freezing point in contrast to the coastal region of the country, where the warmth is unvarying and the rains are frequent.However, the whole of India, south of the Himalayas is climatically treated as a tropical country. The western coast from Kerala to Northern tip of Maharashtra receives very heavy rainfall during July and August while the whole of Coromandel Coast goes dry and it gets wet in winter while dryness is all over India. The interior regions such as the Punjab, Haryana, North-west Utter Pradesh and adjoining portion having continental locations have extreme climatic conditions-very high temperature in summer and very low temperature in winter, while the regions affected by oceanic city such as Mumbai, the Konkana and the Malabar coast have hardly any range, annual or diurnal. Monsoon, the life breath of Indian climate is pulsating in nature and vary from year to year and region to region. Sikkim is the only state in India which experience both tropical and temperate climatic conditions and vegetation’s accordingly. India’s climate is of tropical monsoon type but large size of the country, topographical contrasts, impact of sea, shifting pressure and wind belts have cumulative impact on climatic elements to exhibit variations and thereby create climatic variety at sub-regional level. Variations may also be observed in respect of other climatic elements like temperature, pressure, wind directions and movements, cloudiness, humidity etc. W Koeppen, CW Thornthwaite and triwartha’s classifications of climate are important, but Koeppen’s classification is widely used in India for its simplicity. A systematic study of the Indian climate was made by Koppan in 1918, who divided the country into three broad climatic zones-arid (B), semi-arid(C, D) and humid (A). These are further sub-divided into sub-types on the basis of seasonal variations in the distribution pattern of rainfall and temperature. In spite of these difference and variations, the climate of India is monsoonal in rhythm and character.